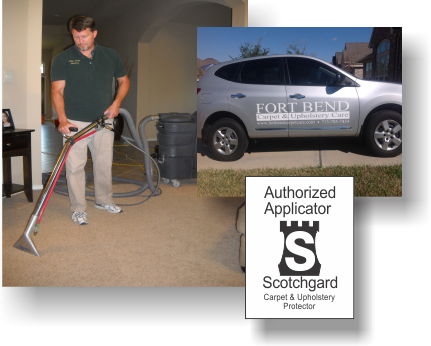 Fort Bend Carpet & Upholstery Care has been proudly serving the Fort Bend and Greater Houston areas since 2004. We are an owner operated business with five primary goals: to provide our customers top quality cleaning services, to be on time, to do what we say we will do, to finish the job we started and to provide a courteous and friendly service experience. To attest to the fact we accomplish these goals, most of our business comes from repeat customers and referrals. In addition to providing excellent service, we also offer extremely competitive pricing. Being an owner operator and not shipping out our work to subcontractors allows us to offer prices well below our larger competitors. Also, when we quote a price over the phone, we stick to it. You will not be surprised with additional charges or upselling of services. Our mission is to make our customers so happy they will not consider calling anyone else for their carpet and upholstery cleaning needs! The experience, the equipment - to get the job done right the first time, every time. We Guarantee It! We now provide carpet stretching and repair!